As if to underline that point, she used her toughest language yet to condemn Russia’s “invasion and ongoing occupation” of Georgia during a Monday visit to Tbilisi, Georgia’s capital. Prime Minister Vladimir V. Putin of Russia responded by chiding Georgia for involving Washington rather than negotiating directly with Abkhazia and South Ossetia, the two breakaway enclaves at the center of its 2008 war with Russia. The region has already changed profoundly since last July, when Vice President Joseph R. Biden Jr. delivered the same message in some of the same capitals. Poland and Russia are in the midst of an unprecedented warming after the catharsis of this spring’s plane crash, which killed Poland’s president and other top officials. Under its new president, Ukraine has tacked sharply toward Moscow, partly in hopes of receiving financial relief. Azeri officials have grumbled about neglect by the Obama administration, turning to Russia as their preferred mediator in the conflict over the disputed area of Nagorno-Karabakh. And Georgia — the only country among them whose relationship with Russia has remained cold — has looked on warily as the relationship between Mr. Obama and President Dmitri A. Medvedev has deepened. President Mikheil Saakashvili allowed as much, commenting on the June 24 “hamburger summit” between the American and Russian presidents. Mrs. Clinton has taken pains to convey that Washington will continue to assert itself in the region, pressing for political pluralism and democratic transfer of power. Though the Iron Curtain is no more, she said in her visit to Krakow, “We must be wary of the steel vise in which many governments are slowly crushing civil society and the human spirit,” including Russia on a list alongside Zimbabwe, Congo, Ethiopia, Egypt and China. She said Washington would continue to finance nongovernmental organizations in the region — an endeavor that has long irritated Moscow — and pledged $2 million to a fund to assist such organizations that were under pressure to shut down. The warnings are timely, said Andrew Wilson, a senior policy fellow at the European Council on Foreign Relations. But he warned that the United States risked losing its bully pulpit if it continued to be perceived as “relatively unengaged” during a period of economic crisis and diplomatic upheaval. Mrs. Clinton faced particularly raw feelings in Azerbaijan, which felt snubbed after the United States ambassador’s position was left unfilled for almost a year, and again when it was not invited to an April nuclear security summit meeting in Washington. The administration has responded with rapt attention: in June, Defense Secretary Robert M. Gates traveled to Baku with a personal letter to President Ilham H. Aliyev from Mr. Obama. But Mrs. Clinton’s most delicate job was in Georgia, whose soldiers are still facing off with Russians at the border of South Ossetia and Abkhazia, the two breakaway Georgian enclaves. Before Mr. Biden visited Tbilisi last year, Mr. Saakashvili said he would ask the United States to provide Georgia with antiaircraft and antitank weapons to help stave off another Russian attack, and officials said they would like the United States to help monitor the enclaves’ borders. Neither request went forward. Any such requests were kept scrupulously quiet on Monday. 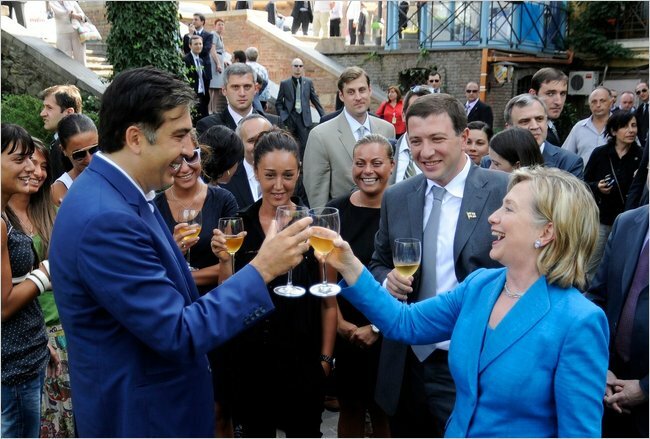 Mrs. Clinton warned Georgia against trying to win back the territories by force, saying it was “a mistake to focus on the past.” Asked whether Georgia wanted American support in replenishing its military, Mr. Saakashvili said the issue would be addressed “step by step,” and he had no complaints about the administration’s position. Alexander Rondeli, the president of the Georgian Foundation for Strategic and International Studies, said Mrs. Clinton’s willingness to use the word “occupation” carried particular weight.